Ever have a day (week? month? year?) when Murphy’s law kicks in? Everything that could possibly go wrong… just did. Sure, there might’ve been a pleasant moment or two in there as well, but it seems those were only in there to get your hopes up so they could be crushed again! As much as we all love it when things go smoothly, we kind of hate reading books like that. Boring! We don’t want perfect characters who only smile and nod and enjoy their peaceful existence without a single wave in sight. We want the author to throw some adversity at them and make them fight for their happily ever after. We want them to suffer along the way, even in Christian contemporary romance. Sure, the kinds of pain and angst and struggles are different for every genre, but even in CCR, the path should not be sweet and idyllic without a hint of a storm… much as we long for that lovely sunset walk on the beach, hand-in-hand with our beloved! You, dear reader, might think the author controls all that, and you’d be (mostly) wrong! Writers fall somewhere in the range of having everything plotted out ahead of time, down to the smallest detail, to sitting down at the computer every day with no preconceptions of where God and the story are going to take them today. Of course, most fall somewhere in between. I tend more toward the latter. I’m familiar with the setting, have a vague clue about the themes from the title I’m working with, and, where possible, I introduce the next book’s main character in a previous story so I can get to know them a little before turning them loose in their own tale. 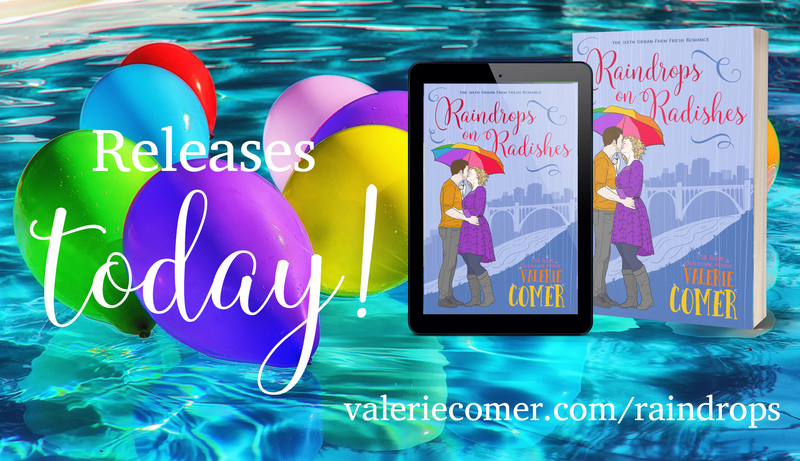 All that to say, Sadie Guthrie, heroine of Raindrops on Radishes — which releases TODAY!!!! — turned out to have some issues I didn’t see coming before I started writing. I knew she was overweight. I knew she was adopted and resented it, but I had no idea of how deep her bitterness, anger, and denial went. At one point, another character (Jasmine) confronts her with the story of the egg, the potato, and the coffee. You can find a well-known version here. The basic gist is that the three ingredients react very differently to being immersed in boiling water. The potatoes go in hard, but come out soft. The egg goes in soft, but comes out hard. And the coffee grounds infuse the hot water with a fragrant brew. The narrator asks, which are you? 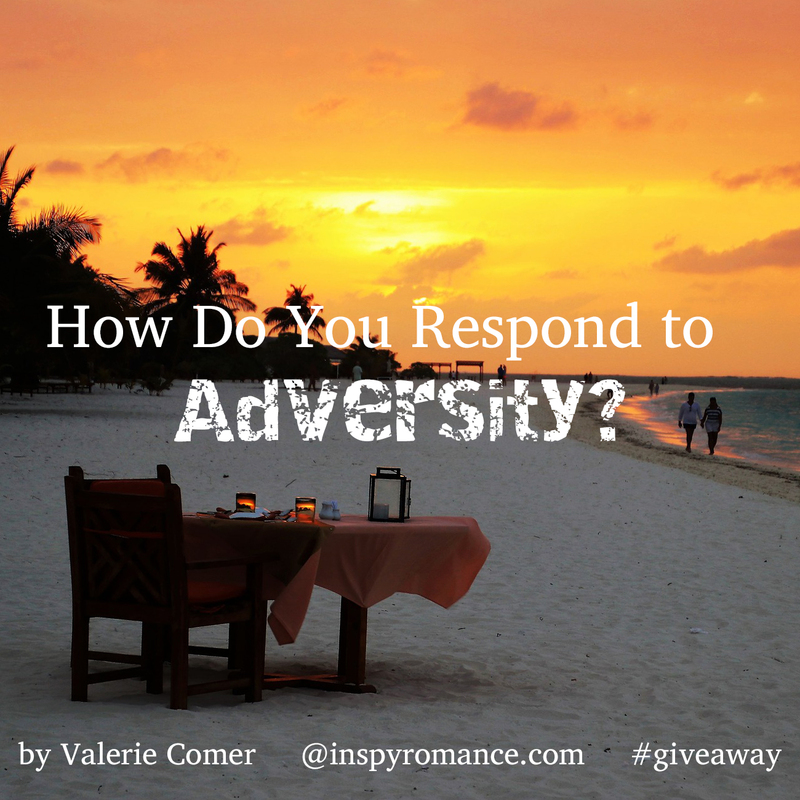 When you’re dumped into adversity, how do you react? Of course, in Raindrops on Radishes, Jasmine changes the potatoes to radishes in her version of the story. Because the title contains radishes, not potatoes! Someone pointed out to me that she didn’t care for that little parable, because it’s not like we can choose what personality we are. We can’t choose to be coffee grounds instead of an egg. And while that’s true, the meaning of the tale is more metaphorical than that. We can choose how we let adversity affect us. We can choose whether to accept the situation and let God soften us in it, molding us more into His likeness. We can choose to become a fragrant aroma to those around us. Or we can choose to become hard, flaunting our bitterness to all who come near. 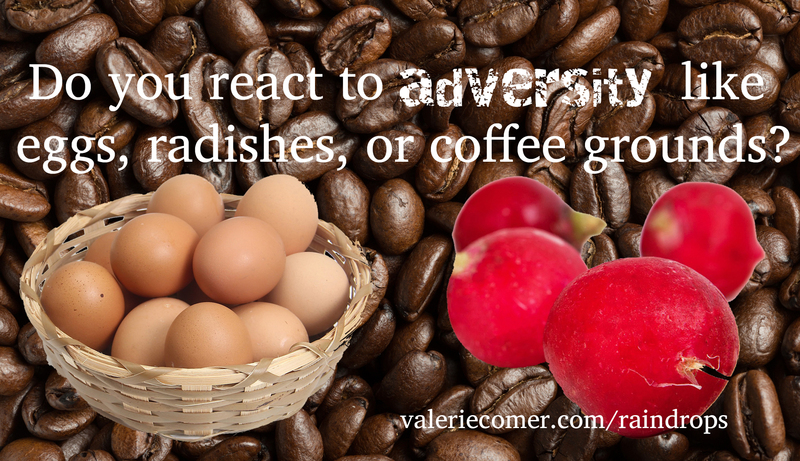 Do you respond to adversity like eggs, radishes, or coffee grounds? For Sadie, it was a hard battle. She’d let resentment take root deep in her soul. She’d made excuses and cast blame on others. But, ultimately, she, like every one of us, had to face her choices and decide whether to keep hugging her bitterness tight to her chest, or let it go and accept the freedom found in Jesus. If you haven’t picked up Raindrops on Radishes yet, what are you waiting for? It’s at the introductory price of $2.99 through the weekend, after which it will rise to $3.99 to match the rest of the books in the series. While it can be read as a standalone, you’ll find the experience richer if you’re already familiar with the characters of Bridgeview in the Urban Farm Fresh Romance series. Interested in reading Raindrops on Radishes? I’m offering one reader a copy (e-book only, worldwide). If you’d like to put your name in the hat, please comment by Saturday evening, February 16. Winner will be announced in the Sunday Edition. Royalty-free images found on Pixabay. This month has been one of those months where things keep going wrong. Two weeks ago I believed my wallet was lost only to find it the next day, (after I had already called and cancelled all my cards) frozen to the parking lot under my car. Then I had switched wallets and we got more snow and the people who clear the sidewalks were late that morning so I was more worried about falling and didn’t notice dropping my wallet in the 5 inches of snow on the sidewalk. Came home to find it had been torn apart by the snowblower and had to request yet another debit card. Now yesterday I had gone and picked up my daughter and my friend’s 3 kids from school and stopped to grab skme burgers for dinner. When I went to leave my car wouldn’t start, even with a jump. So now I have to borrow money to get it fixed whatever the cause may be because the auto shop I have a credit card for isn’t in this town. All of this just before my 35th birthday on Monday. Yeah, happy birthday to me. So guess I am the egg getting harder and bitter over things going wrong left n right this month. Hi Valerie, love the parable. I aim to be the coffee and with God’s grace aim to reflect Him. Like you say, this is NOT easy, but at least by keeping Him in focus it is easier. I am looking forward to reading Sadie’s story. PS- we love radishes, the boys eat them straight from the garden, but I have never eaten them cooked- will have to try it someday. The fragrant brew. I love it. And try the radishes – it’s like having a completely different vegetable in your aresenal! Hi Valerie! Congratulations on your new release. Starting reading Raindrops on Radishes in the middle of the night. Thought provoking parable and question. While personality plays a role in how we respond to adversity, I believe I have responded as an egg, potato and coffee grounds. Different seasons in life and different circumstances made me respond to adversity in a variety of ways. As a child, a German American immigrant who was bullied, I was an egg – soft which over the school years hardened / tone out the hateful name calling. Hardening is a survival technique . As a stubborn German I hate change, so I could be a hard potato, which softened through prayer and God’s gentle nudging. But because of my personality and the way I was raised, I approach adversity as the fragrant aroma of coffee. My father always said, “So ist das Leben. (That’s life. )” Besides German love their coffee. Best wishes. Enjoy the weekend. What a great point, Renate. Yes, I’m sure we all do respond differently at different times to different adversities. The right heart attitude goes a long way in the right direction, but things catch us off guard and we fight to make the right choice again. Good morning 🌞 Valerie! Congratulations on release day for one of my favorite books! I so related to Sadie in so many ways… thank you for such an amazing story!! Thank you and you’re welcome all rolled together! And yes, sometimes any of those are the right choice, at least for a time! Congrats on another new release! Looks like it will be a good one. When I get to the other side of whatever adversity I am going through, I often am wishing that I had trusted God more through it and worried and stressed less. So my goal is to be like the coffee! Good morning. Congrats on your release. This is a very interesting post. I think for me, it depends on the situation I am thrust into. Example: when my dad died, I was named executor. In a very short time I was all three at once. As time went by, I became softer and yet more assured and yet totally confused. At the end, I was spiritually more balanced and yet still confused on what dad did. Sigh Oh well. Sounds like a good riddle. My first response is the frog, right? Poor thing sits in the heating water and doesn’t even realize he’s in adversity until it’s too late to react. A parable for another day! Hi Val! I love radishes, so of course, I had to buy the book. :) It sounds like a great story. I hadn’t heard that analogy before, so thank you for sharing. Happy release day!! And I love how your story titles are unique–no duplicate titles for you. I’d like to think I’m a fragrant aroma when it comes to adversity, but……I need to examine and see. And I feel that if we do face it like a potato (radish!) that we can ask God to soften our view-that we can learn from who He is and who He would have us be in Him. Thank you for a great post. Thanks for picking up a copy :) You’re right, if we have an attitude of taking adversity to God in prayer, He can and will definitely change us so that we’re aligned with Him. But adversity is still hard. Great post Valerie. It seems like my whole last year went wrong. But there was some right in there. And yesterday I found the words I thought I’d lost in my current WIP. So maybe things are turning around. I hope I’m coffee grounds. Adversity!!! Murphy’s Law seems to be part of life!!! Be flexible! Thanx for the giveaway. Can’t say that I’d ever heard of the story of the egg, the potato, and the coffee before – it’s raising on interesting discussion. I’ve been having a couple weeks’ of “Murphy was an optimist” events….but feel like I’m starting to see the light again. Best wishes on the publication. I can relate to all three depending on situation and the stage in my life. But I’ve learned to trust my Lord that it’s for the best, right…because He says so. Amen! He is SO trustworthy. I noticed your new book in my kindle this morning! How exciting! I just started reading before my grandkids came after school. Now we have perler beads and games to put away! It’s fun to play with them. You definitely can choose how you react to things in life. We all make choices all the time , done are big and some are little. Grandkids first, reading second! Enjoy your time with them :) Thanks for ordering. I appreciate it! It sounds like another exciting book. I’ve always found the story/parable of the radishes/potato, egg and coffee quite interesting. I feel like we can react differently to different situations but like the ideia of throwing raindrops in radishes to soften them. Little by little maybe and not all at once. Thank you! And that’s an interesting way to deepen the connection of the title to the parable that I hadn’t thought of! I would love to be coffee grounds (don’t drink the stuff, but love the smell! ), but I end up being the egg most of the time. One of the biggest struggles I have is dealing with adversity. Without going into details (which would take forever! ), my husband and I recently celebrated our 25th anniversary and the majority of those 25 years (starting the week after we got married) have seemed like boiling water. It seems like every time we thought things were maybe getting better, something else came along. And, even though I know without a doubt that it was all satan fighting us for whatever reason, it has been very hard for me to NOT become the hard-boiled egg. In the past few years, God has truly been working on me, so that I’m slowly becoming less egg-like. Makes me very grateful for His faithfulness and patience! Looking forward to reading your new book! I love radishes so the title alone makes it a TBR! Oh, Lisa, my heart goes out to you. 25 years nonstop is a very long time! God is faithful. Hang in there!!! Your book sounds like just what I need to read! Recent health issues for me/hub have really shown me adversity! Thanks for your giveaway! I am an avid reader and hope to read your book. Congratulations on your new release, Valerie! I really like that parable – I think it’s a great reminder that, while we all go through adversity, we can choose how to face it. I love the title of your book! Sounds like a great story! Thanks for the reminder of the parable. I’m going through some stuff now and it has helped me rethink some things. Hugs, Laura, and blessings to you. Would loved to read it. Thanks for the chance! Valerie, I loved your insights about the coffee grounds. I found the story and shared with my posse. Thank you. My first tendency is to be like an egg, which I really need to work on. Congratulations on your new release ! Cant wait to read Love all the paperback books! Thank you so much Valerie for letting me know I will get it so I can read it! Have a great day!